When you ask your kids to do their chores they dread them and think they are worse than finishing their homework or studying for a test. But what if you made chores fun? What if your kids arrived home from school eager to complete their chores? How happy would you be that there is less clean up for you to do after the kids to go to bed? You'd have more time to do some things that you want to do like read a good book or go to bed early! While you might think doing the laundry is easier than making the bed, your kids may disagree. Let them chose their chores each week by making a list of all the available chores in the household, and let them draw straws or flip a coin to see who chooses first. Next, let each child chose from the list of chores. This allows the children to have some control over what they have to do, and in many ways, it will make them happier when they chose the tasks they'll have to do each day. If you don't know what you're doing are you happy? Nope, you're frustrated and feel incompetent. Your kids will feel the same way if told to do a chore but with no training. Here's how to teach Chore Training 101. Introduce new chores to your children in a calm and enjoyable way during a time when they are fresh and can concentrate. Act like you are giving them a special treat and say something like, "Would you like to learn how to make hospital corners on a bed?" When they learn in an unhurried way, with your full attention, it makes them feel close to you and also ensures that they will feel competent to complete the chores on their own. 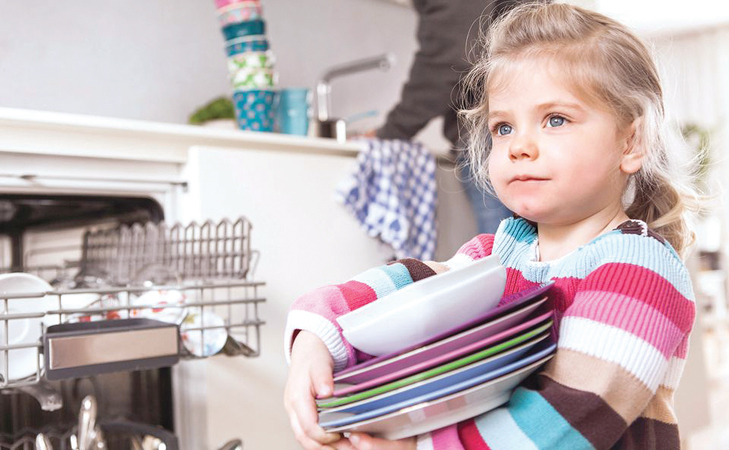 For complicated or dangerous chores, such as cooking, make sure you have several training sessions before giving your children full responsibility. Be creative when devising the games and ask your kids to help think of the rules. An example would be folding the towels neatly in a timely fashion. The object of the game would be to fold the towels the way they were taught in Chore Training 101 and be able to stack them properly in the linen closet. You can use an hourglass timer or stopwatch on your phone to keep track of the time, and give a child a certain and reasonable timeframe by which the chore needs to be completed -- you don't want him or her rushing. Singing makes any task more pleasant. You can use the melodies of existing songs and make up your own words. In many cases the lyrics can be about the chore themselves, such as, "This is the way we fix the bed; fix the bed; fix the bed." Another option is to have kids sing along to their favorite songs that you have playing on their iPods or the family computer as they complete their chores. They can dance around while cleaning up their room, and heck turn it into a game that they have to clean a corner of the room before the song is done! Children love to receive positive reinforcement. Whether it's a gold star or a special sticker, kids love little tokens that reaffirm that they have completed a job well. The rewards should be age appropriate. You can keep track of completed chores on a chart. Take before pictures and after pictures so the child can truly see the work they've done. Seeing is believing! Instead of having each kid alone in their rooms or in other areas of the house doing chores on their own time, make it a family activity. Every family member can play a part in the daily or weekly chores. Examples would be two people fixing the bed, two people helping move the laundry from the washer to the dryer, or setting the table together. Kids may get bored with mundane chores such as fixing the bed, throwing out the garbage, or vacuuming. So create new fun chores. Let them come up with ideas for more exciting chores. This could be cleaning the shower doors while taking a shower, or purging their closet of old toys and games to make room for new ones before a gift giving holiday. The worst thing you can do is constantly criticize your children during or after they've completed their chores. If you tell them they are doing the chore wrong, they won't have any desire to complete their chores in the future. Instead, always notice the parts of the chore they did well, and compliment them on the task. If they ask, give them a few helpful pointers, to make it even better next time.